Now is the perfect time to convert from electric baseboard to gas furnace. Natural gas offers more comfort, convenience and efficiency. While an electric furnace to gas furnace conversion or an electric baseboard to gas furnace conversion might seem to be a massive job, Advanced HVAC ensures that the conversion and furnace installation is as smooth and cost-effective as possible. Energy efficiency – Using natural gas for heating uses less energy. 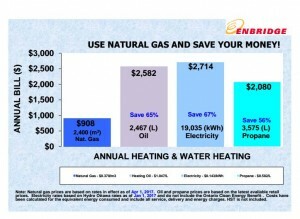 Switching your stove, dryer and water heater to natural gas also offers significant cost savings. Environmentally friendly – Natural gas is one of the cleanest available fuels. It produces 45 per cent less carbon dioxide than coal, with fewer greenhouse emissions than any other fuel. Affordability – Natural gas costs less than electricity, oil and propane for conventional home heating. Comfort and convenience – The comfort and convenience of natural gas are readily accessible with the flip of a button, and there’s no need to worry about a supply shortage. According to Enbridge Gas, in Ontario customers are consistently switching from electric baseboard to gas furnace heating due to the significant cost savings and dependability. A normal Enbridge residential customer saves over $1,700 a year, compared to those using baseboard electricity. Electric baseboard to forced air heating can be more challenging of a conversion than any other types of conversions but has the greatest return on investment both in savings and added value to your home. Advanced HVAC specializes in electric baseboard to gas furnace installations. In fact, we have many certified technicians that specialize in electric baseboard heating to gas furnace conversions and will guide you through the entire process. We also collaborate with Enbridge Gas on your behalf by completing the gas meter application. We are experts in oil to gas conversions and are happy to discuss the benefits. Fill out the form below to get more information on furnace installation and conversion or to get a free quote.